The nation’s biggest ports are off to a mixed start compared with 2018’s record year, showing slower 20-foot-equivalent container volume as the economy gradually slows and with U.S.-China trade talks set to resume shortly. The nation’s top two ports, Los Angeles and Long Beach, reported decreases in February in the number of TEUs processed. Los Angeles saw a 2.7% year-over-year decrease, moving 705,306 TEUs compared with 725,059 for the same period in 2018. 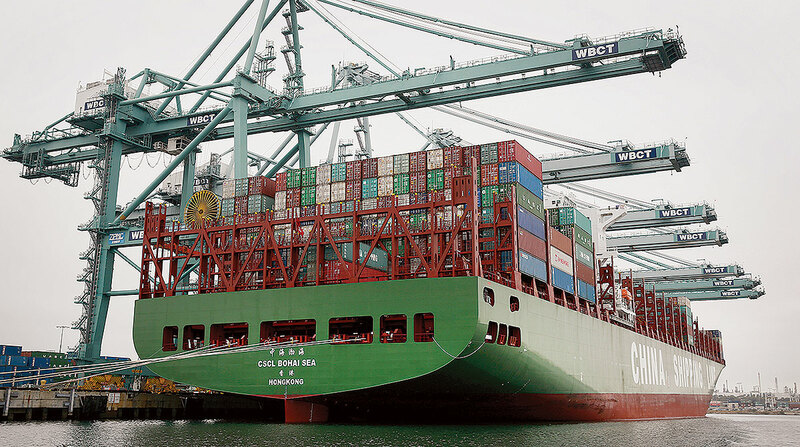 Long Beach saw its numbers drop 9.8%, to 596,616 TEUs from 661,790 a year earlier. Besides the uncertainty over trade negotiations, port officials and economists said there is another reason for the drop-off, especially at the major West Coast ports. The timing of Lunar New Year, Feb. 5-19, caused production in many Asian nations to slow and resulted in some cargo being shipped in January rather than February. The Port of Oakland moved 185,685 TEUs in February, down 1.3% from 188,175 in 2018. The Northwest Seaport Alliance, which operates ports in Seattle and Tacoma, Wash., in February moved 269,199 TEUs compared with 279,488 last year. Despite the February drop, year-to-date container volumes are up 10.9%, in part because of an exceptionally strong January. Bingham pointed out the Chinese New Year has much more of an impact on the West Coast ports than the East Coast facilities because the shipping time from China to California and Seattle is substantially less than going through the Panama Canal and then to ports in Florida, Georgia, Virginia and New York. The U.S. economy advanced an annualized 2.6% rate in the fourth quarter of 2018, beating market expectations of 2.4%. However, many economists, including Bingham, expect the economy to slow. Along the East Coast, the Port of New York/New Jersey reported it had a 6.3% increase in TEU volume in January, moving 622,531 units compared with 585,864 in 2018. February numbers are not available yet. The Port of Virginia had a strong February, moving 228,151 TEUs compared with 218,727 last year, a 4.3% increase. The South Carolina Ports Authority, which operates the Port of Charleston, reported a 5.7% year-over-year increase, processing 178,131 TEUs in February, compared with 168,480 in the 2018 period. The Port of Savannah set an all-time record in January by moving 430,071 TEUs that month. February, however, saw a significant drop-off to 312,042 TEUs, compared with 341,094 in 2018. Still, for the first two months, that facility is running far ahead of the record pace set in 2018. In February, the port also announced plans to expand berth capacity, adding 21 new cranes and replacing 14 others so the facility will be able to simultaneously handle six 14,000-TEU ships by 2024. Those are the among the largest now transporting cargo on the world’s oceans. Meanwhile, trade talks between the United States and China are set to resume March 28 in Beijing. Chinese officials plan to come to the United States next week for the negotiations. President Donald Trump has said he would like to welcome Chinese President Xi Jinping to his South Florida home for a summit if a trade agreement can be finalized.